Summer is over and Fall is here with plenty of cold, rainy wind… and of course, the ubiquitous comparatively sluggish real estate market. I say “comparatively sluggish” because housing in our city is still selling quickly and inventory remains very low by the measures of conventional wisdom. Nonetheless, average days on market for residential homes for sale is increasing while market action is waning. Current median asking price for properties in Portland is $518,000 and the average list price is $635,476. Following the waning market action, prices have been settling down a bit from their all time high in the spring/summer but even still, ever since the Great Recession, Portland’s real estate market is continually defined by (lack of) inventory. Inventory is up, although at least some of this is due to seasonal slowing. 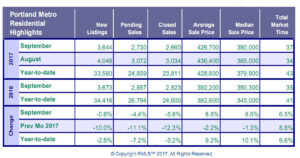 An old adage in real estate is that a real estate market is considered “neutral” or balanced when the housing market has six months of inventory available with inventory defined as inventory-in-months. Months of inventory is defined as the number of months it would take to sell every listing at the current rate of sales. Currently, there are 2.3 months of inventory available in Portland, Oregon. And, while this may sound low, Portland real estate agents haven’t had this much available inventory-in-months for since the winter of 2014/2015. 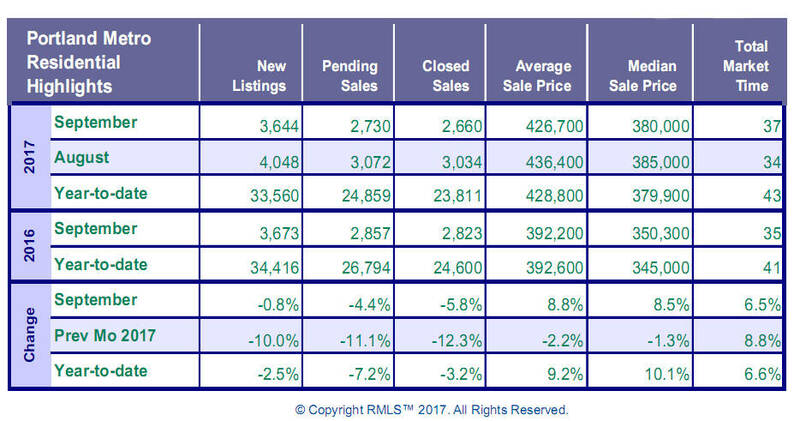 The accompanying graph shows inventory of Portland real estate and clearly illustrates the fact that available listings has increased dramatically. Only time will tell what this means for sure, but this could be an early indicator that Portland’s real estate market is softening, or it may just be a more pronounced seasonal slowing than we’ve seen in the last few years. Prices are settling, inventory is up, however both of these things happen every year. Hopefully, this increased inventory will lead to prices stabilizing into a slower, more sustained growth rather than the frenetic feeding frenzy that we Portland real estate agents have witnessed over the past few years. For the month of September, 2017, the average sale price of a Portland home is up by 9.2% as compared to the same month a year ago. And, while that is certainly a very noticeable price increase it’s also worth pointing out that closed sales for September have dropped 5.8% as compared to September of last year. This drop in closed sales in conjunction with the last year’s price increases might indicate that Portland has finally hit the cost/value cutoff where buyers are less willing to purchase. Comparing September with August shows an even more precipitous drop off: September home sales were down 12.3% from August sales. Portland Housing Market Highlights courtesy of RMLS.com. It will be interesting to see what happens over the traditional slow winter real estate months into which we’re now entering. What no one knows for sure is whether we’re entering a normal period of seasonal slowing, a cooling of the market leading into a healthy plateau, or a market correction where affordability increases and we shift back into a buyer’s market. NOTE: This article is solely the opinion of Richard Lockwood and is not legal or investment advice. Real estate agents cannot promise future profits or losses. This custom real estate search engine and IDX database (richardnet) were created by and are the property of Richard Lockwood, Copyright © 2019.